Serve delicious pasta in this exciting combination between match 3 and time management game. Help Daisy, the newly appointed chef of Smiling Pasta avoid hostile takeover from a greedy corporation. 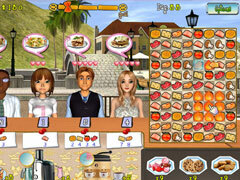 Create combos, buy new recipes, treats and upgrades in this delightful match 3 and time managament game.